Most Steinhatchee Fishing trips are booked about a month in advance. A $100.00 deposit is requested upon booking. If your trip is cancelled two weeks in advance, your deposit can be used to reserve another date. Our Full Day Fishing Charters are 8 hours with up to 3 people. Our Half Day Fishing Charters are 4 hours with up to 3 people. What to expect when you book a Florida Flats Fishing Charter with On The Mark Guides. You'll be very comfortable fishing from a 25-foot Carolina Skiff with a center console; this open fishing boat provides ample room for your party. Your Captain will pick you up at your choice of any marina in Steinhatchee. The boat will have 2 ice chests on board--one for your fish and the other for drinks and food. The normal time for departure is 7:30 a.m., and you will be back at the dock about 5:00 p.m. These times can be adjusted to fit your individual needs. All of the Marinas offer fish cleaning services if you need them. Remember that this is your trip, and we want it to be one full of good times and good memories. 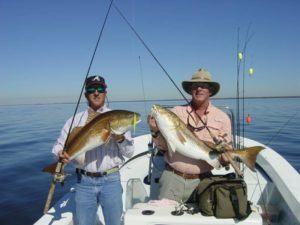 Depending on the time of year, a variety of fish will be caught including speckled trout, redfish, rock bass, Spanish mackerel, cobia, sand trout, flounder, and shark when fishing with us. If you are looking for more adventures, On The Mark also has great scalloping trips! Great for all ages and experience levels. Scalloping trips fill up fast, so reserve your spot today. Interested in a Scalloping Trip? Our Scalloping trips are an experience not to be missed! Grab your snorkel gear and reserve a spot for the upcoming season.